Hand Skeleton Bracelet - Best of thedefy! Fond of Dark Fashion and goth bracelets? Here are the best choices. Goth ornaments are admired for centuries. These bracelets are much suitable for punks, ravers, goths, hippies and lot like us. Made with precision and with unique designs, these goth bracelets have no alternatives. 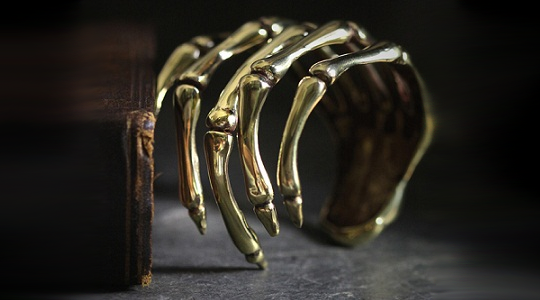 Gold Human skeleton hand bracelet, hand bones handcrafted in brass. A dark fashion bangle and a Galibardy classic. Adjustable for a comfortable fit.